Holding onto the top spot is Capo Plaza once again with what has become my favourite tune off his album, 20. Lyrically and musically this track is a bit more significant compared to some of his other tunes, and it makes it easy to listen to over and over again! I have definitely been in a Junior Eurovision mood lately, and the French entry is certainly one of my favourites of the year. This is such a feel good song that has the ability to put a smile on the face of anyone who listens to this song or watches the performance. Keeping with the Junior Eurovision theme, we’ve got the acoustic version of the Belarusian entry, Time. As much as I love the original version of the song, this rendition featuring Kirill Good is next level. Both their voices mesh well together and it’s a joy to listen to! Darina Krasnovetska is definitely one of the most talented in the Junior Eurovision field of 2018, and her song is fantastic too. She is definitely the child version of Jamala, and it’s unsurprising that we saw her finish in a Top 5 position at the contest. Speaking of incredible vocalists, Daneliya is definitely in that category. This song was definitely the best way for Kazakhstan to make their debut at the contest, and despite not finishing as high as what we all may have expected, this was a memorable debut. Back to the Italian rap portion of our Chart Toppers, this is a fresh tune from Salmo off his latest album, Playlist. It’s short and snappy, and that seems to be Salmo’s specialty. One of my favourites off the album! The love for this song isn’t dying down just yet, with this one of my favourites of Capo Plaza’s album, 20. The beat and the melody of this one is special, especially the intro leading into the verse. This definitely has a long verse, but the build to the chorus is great. This is another prime example of Salmo creating music that is short but really packs a punch. The speedy lyrics are part of the charm of this song, but the flipside is that this is a very difficult car karaoke song! There’s a reason why this was one of the most popular singles of the album 20, and that’s because it’s definitely one of the best of the album. It closes the album, and I can’t think of a better way to do that as it is as epic as the album begins! This will likely be the only song to have been in every Chart Toppers post of the year, and the rate of which I play this song doesn’t seem to fading anytime soon. This is the ultimate Salmo track, and if you were to only listen to one of his songs, make sure it’s this one. A quick break from the Italian rap, we have some retro pop from Irish Junior Eurovision star Taylor Hynes. It took a while to catch onto this song, but the music video is very lovable, and so is the charisma of Taylor. I have recently rediscovered this gem from Emis Killa, but the short break from listening to this song has made me remember why I enjoy it. There’s a simple chorus, but catchy nonetheless, and of course a good appearance from Capo Plaza. 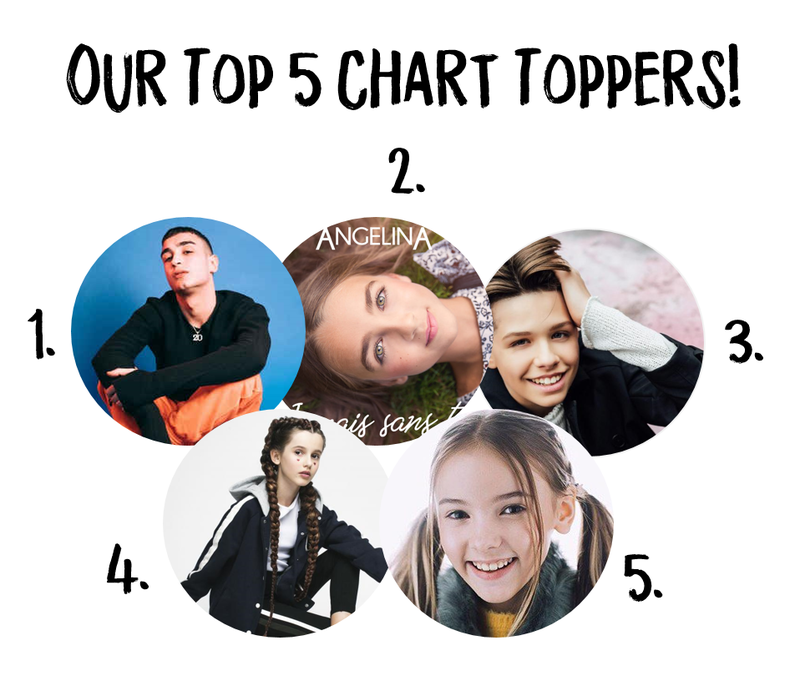 The final Junior Eurovision song in our Chart Toppers, this is perhaps one of the best from this year’s edition in terms of vocals. This is a contemporary song, and it’s easy to forget that it’s not an adult performing this entry. Although this isn’t a short track from Salmo, he packs a major punch throughout the almost 4 minute track. We get a little Latino break in the midst of the rock-electronic rap style which is a great way to spice things up and create something truly unique. Another Capo Plaza song, and perhaps not the most memorable off the album, it is still another enjoyable one provided that you enjoy his style of music. Gue Pequeno is great at more of a pop style rap, but he also proved that Trap music is right down his alley with this track. The mysterious intro and beat is addictive, and so is the melody! Another song worth a listen if this is your style. This is definitely the most upbeat track from Capo Plaza on our Chart Toppers, as the song definitely has a tropical sounding beat. This is a catchy number, and definitely radio friendly, or at least one of his most radio-friendly tunes. This is another rediscovery on this week’s Chart Toppers, and it certainly has been a while since I have heard this song. The beat and melody are both super catchy, and there’s something very hypnotising about the almost monotone vocals. If you want to learn Italian, this is the song for you! This was a massive hit a while back in Italy, but it’s easy to see why since it’s super catchy! The verses mainly consist of J-AX saying a whole bunch of words, but the pre-chorus picks up and leads to the catchy chorus sung by Il Cile. Speaking of catchy tracks, this is definitely one of the best tracks from the collaboration between J-AX and Fedez. This song reminds me of being on holidays during the summertime, and that can only be a good thing!